of the book that they knew done them good. The section or game where they know they learn't something. I quickly received 3 replies. (or could we have a chess analogy - to start the pawns rolling). by Irving Chernev from the Edinburgh public library. I eventually bought a Faber paper covered edition which I see cost me £1.10. This must have been 1975 or more likely 1976. My only quibble is that it is in descriptive notation !!! 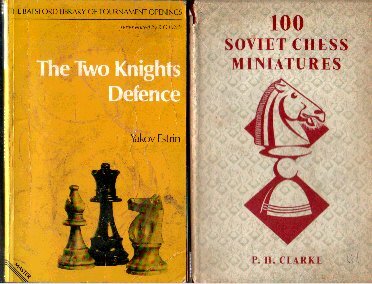 Favourite games - Alekhine v Yates 1922 & Olafsson v Fischer 1958. I like this book too. The picture is from my original 1974/75 copy. My only 'quibble' is the lack of finachetto games. been instructive King's Indian, Benoni's, Grunfeld's? But your are right, an excellent book. A game that made a big impression on me was No.19. Kupferstichvs v J. Andreasen, Copenhagen, 1953. The See-Saw Check, Zugzwang and Other Tactical Tricks. Of the two games you selected Alekhine v Yates is well known. his King to join the attack. and now wins with 38 Ke5. Your second choice is also a cracker. target pawn on e6 to build counterplay around. I bet the 14 year old Bobby leaned something as well. 'Re-thinking the Chess Piece' by Andrew Soltis comes highly recommended by me. actually devised for computers than for teaching human beginners until reading this book. computers. I've just picked up one of my old Chess books at random. A Breviary of Chess by Tartakower printed by Routledge in 1937. Interesting the Queen getting 10. Most books give the Queen a 9. 8*8 board (Capablanca once played a match on a 12*12 board and computers on a 6*6). be applied to every stage of every game played. The values are guidelines, rules of thumb. and a pawn are 'ALWAYS' better than a Knight and Rook. as the return on the invested time is worthwhile IMHO. Cheers. I still have not figured out who you are. I assume you are a protestant Indian with large cheek jowls. you feel it has done you some good then I shall not argue. "thinking like a basic computer (as we are all taught)"
because we recognise some positions are (for a human) difficult to play. A computer cannot possibly know what is difficult for a human to calculate. sacrifice knowing/hoping the player will stumble in the complications. I'm not alone in thinking playing computers does your Chess harm. They are OK for a quick skittles when nobody is about. to a 2 move combination. Humans do it all the time. All the time. However it sounds like good recommendation. I'll look out for it. And now the last entry (too date) from the notice board. Always like to talk books! Being an ex-bookseller and all. Well, as you are always saying, players need to learn to attack. They also need to know how to press those attacks home successfully. So my list is firmly in that line. Read the classics - the romantic period and the great early attacking players. but you'll have some real fun along the way!! I agree, Vukovic - The Art of Attack in Chess is a classic. John Nunn. This version is seemingly very good. instead of the original "..and White wins." The Art of Attack in Chess was another of my first real Chess books. I learn't all my attacking tactics from Du Mont's 200 Miniatures. way - tactically. These ideas you can carry forth into the middle game. all openings. The King's Gambit is stodge compared to some Two Knights mainlines. Alekhine's 1908-1923 is a must have in any players collection. Keres I read late in my career and he gave me nothing. Spielmann,and Tartakower (his 500 master games is a superb book). I have never picked up anything from a pure Tal game. Maybe a sharp opening idea but nothing more. I doubt if any player really has learned anything from Tal. When he played bad, he played bad. I can do that. we normal players can never imagine. attacks. Some of Tal's games are totally beyond my compression. Breath taking, beautiful and impossible to emulate. putting your pieces on aggressive squares without a second thought. Study Tal for 20 years. You will never become a Tal. Not in a 100 years. The best book I've on seen Tal is by P. H. Clarke. Clarke is the British Reinfeld & Chernev. with a few well chosen words is an art form unto itself. Clarke comes the closest, in my opinion, to explaining Tal. He's even better than Tal at getting to the root of Tal. Let's have more people sending in their best book.